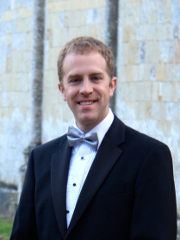 In 2013, Godalming Band were delighted to announce the appointment of James Haigh as our new Musical Director. "I am really excited to be able to take the position of Musical Director here at Godalming Band and continue the long tradition this band holds in the local community." Having grown up in a musical family it was inevitable that James would start learning music from a young age. Beginning to learn cornet locally at the age of 7, and after a brief defection to strings, returned to brass to play cornet with Guildford Citadel Senior Band at the age of 10, James’ ability was spotted by his Band Master Clive Rubery (previous MD of Alder Valley). Moving to Soprano Cornet at the age of 13 and not being deterred by reconstructive jaw surgery started to conduct at the age of 19 and replaced Clive Rubery at his retirement. Regular ‘depping’ continued with local bands, including Godalming Band, as well as international tours and television appearances with Chalk Farm Band. James was then appointed the Musical Director of Farnham Band in 2006 and realising that conducting was becoming a passion, attended Bournemouth University and University of Plymouth to study Music graduating in 2010. Performance and conducting continued while located on the South Coast including spells with Bournemouth Concert Brass and Bournemouth Symphony Youth Orchestra. Unfortunately due to the distances involved had to resign from the post at Farnham, but was quickly recognised locally by Verwood Concert Brass beginning on Soprano Cornet then Principal Cornet and subsequently as Musical Director of their newly formed ‘B’ band. Work commitments then returned James to the Godalming area taking the job as IT Network Manager and recently Assistant Housemaster at King Edward’s School Witley. James’ long connection with Godalming Band extends beyond just the musical side of life as it is probably (although neither of them can remember exactly) where James met his now wife Jennifer on the band’s trip to Herpen in Holland. Outside of the brass band world, James is also a keen vocal musician and has twice won BBC ‘Choir of the Day’ with the close harmony choir Salvacosta.